What do acetaminophen-propoxyphene tablets do? ACETAMINOPHEN-PROPOXYPHENE (Davcocet®, Propacet®, Wygesic®, E-Lor®, Propoxacet-N®) is a combination of two different types of pain medicine and is used to treat mild to moderate pain. Federal law prohibits the transfer of acetaminophen-propoxyphene to any person other than the patient for whom it was prescribed. 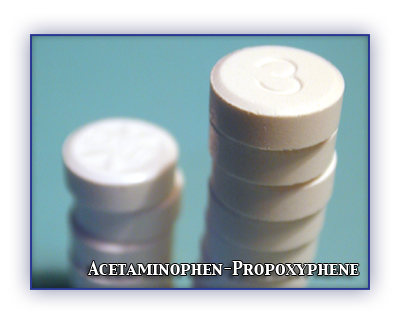 Generic acetaminophen-propoxyphene tablets are available. What should my health care professional know before I take acetaminophen-propoxyphene? Take acetaminophen-propoxyphene tablets by mouth. Take acetaminophen-propoxyphene with food to prevent stomach upset. What other medicines can interact with acetaminophen-oxycodone? What side effects may I notice from taking acetaminophen-propoxyphene? What do I need to watch for while I take acetaminophen-propoxyphene? Tell your prescriber or health care professional if your pain does not go away, if it gets worse, or if you have new or different type of pain. Do not take other pain-killers with acetaminophen-propoxyphene without advice. To reduce unpleasant effects on your throat and stomach, take acetaminophen-propoxyphene with food or milk and never just before lying down. Acetaminophen-propoxyphene may make you drowsy when you first start taking it or change doses. Do not drive, use machinery, or do anything that needs mental alertness until you know how acetaminophen-propoxyphene affects you. Do not sit or stand up quickly. This reduces the risk of dizzy or fainting spells. These effects may be worse if you are an older patient. The drowsiness should decrease after taking acetaminophen-propoxyphene for a couple of days. Be careful taking other medicines that may also make you tired. This effect may be worse when taking these medicines with acetaminophen-propoxyphene. Alcohol can increase possible drowsiness, dizziness, confusion and affect your breathing. Alcohol can increase possible damage to your liver. Avoid alcohol while taking acetaminophen-propoxyphene. Acetaminophen-propoxyphene can cause constipation. Try to have a bowel movement at least every 2—3 days. If you do not have a bowel movement for 3 days or more call your prescriber or health care professional. If you are going to have surgery tell your prescriber or health care professional that you are taking acetaminophen-propoxyphene.